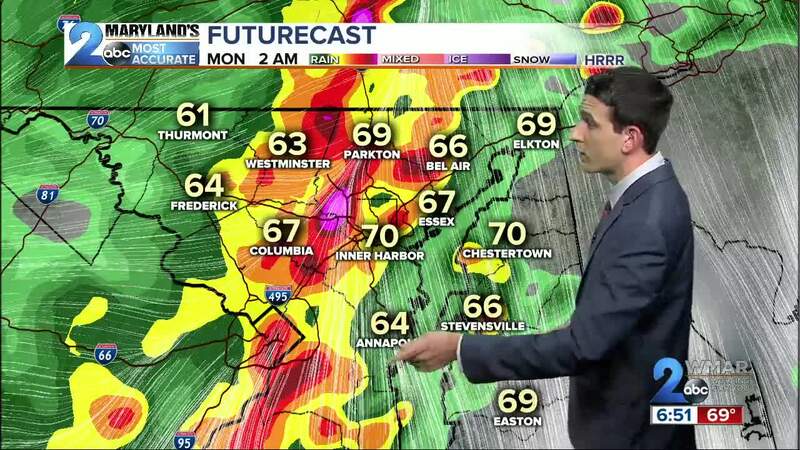 Wind, hail, heavy rain, and an isolated tornado..
BALTIMORE — "ENHANCED SEVERE WEATHER RISK"
An interesting Sunday afternoon and overnight ahead as a powerful area of low pressure marches our way. Severe weather took aim at the Deep South last night with numerous reports of tornadoes, flooding, and big hail. Several deaths were reported as a result of the storm system which is now marching our way. The storm will come in two waves as a result of the warm front lifting north earlier in the day and the cold front providing us with the main show overnight. The combination of the two fronts with low pressure deepening to our west and rich moisture make for the perfect ingredients for storms to form. For that reason the Storm Prediction Center has placed the parts of area under a "Enhanced Risk" which simply means that we could have many storms reaching severe limits. On a scale of 1 to 5 we are running about a 3 for severe activity here in central Maryland and a 2 in western Maryland. This will be a widespread severe weather event with all hazards on the table (wind, hail, isolated tornado, and flash flooding) even during the overnight hours. Storms look to bubble around mid to late afternoon before a break then another round of heavier storms during the overnight period into the early morning hours of Monday. The best window to plan around would be 5-9pm for showers and storms especially west of Baltimore. Gusty winds and flash flooding are the biggest threats overall but an isolated tornado cannot be ruled out. The second and more impressive round of storms arrives between 11pm-3am. Once again the primary threats will be damaging winds and flash flooding concerns. Winds at the surface will be coming in from the south, while the wind higher up comes in from the west. This leads to some extra lift and convergence in the atmosphere above precluding a damaging wind threat across portions of the area. There is also a little spin as well do to the changing directions of the wind aloft giving us a nonzero tornado threat. The best chance for this to happen looks to be over Western MD mountains and up to the north across the PA/MD state line. Rainfall amounts will be upwards of 0.5"-1" in many locations through Monday. Higher amounts of 1-2"+ are expected west of the area over the mountains where the front looks to hang around a little longer. Storms look to be at there highest coverage during the evening and overnight hours. Another round of severe weather is expected later this week.